Eric and Larry are from Maine and New Jersey respectively. They met at Keene State College in New Hampsire as undergrads getting their BS in being muscleheads. They cared more about the gym than most other things. They trained at the Fitness Factory in town and the walk wass about a mile from campus, sometimes a cold mile in rain, snow, and wind. Eric and Larry walked through a blizzard one Saturday to get to the gym to find out it was closed because of the weather. They staying touch over the years. Eric moved to Utah, got married and started a family. Larry moved to California, got married ,a started a family. Larry was visiting Eric in Utah in 2007, when Eric wass starting an air duct cleaning business called Shamrock. Eric talked Larry into helping with a job in Park City, Utah. Aig house, lots of work. Then he talked Larry into joining his venture into entrepreneurship. Eric and Larry were going to focus on spectacular service with a great attitude, and work ethic. Nothing was going to stop them! They started in January 2008, right when the economy was taking a large turn. Shamrock expanded the air duct cleaning business to California where Larry was in Rancho Cucamonga, expecting the work load to be large enouph to go back and forth to Utah.Shamrock also changed the name to California Healthy Home. The work load was large for about 2 months, then the economy turned more. They were in survival mode doing any job they could get, from janitorial service all night long to trash outs all day. They started getting requests to clean carpet so they started that, then tile, and uplostery. They even went to a school in Canada to learn to polish stone. Work improved with all the services, the chamber of comerce in Rancho Cucamonga, Upland, and Claremont helped also. Then a big restoration company asked Eric and Larry to clean carpet for them. They would go to a job and the client would be so angry with the restoration company but like us a lot! They were not getting good service so Shamrock decided to give good service to the restoration industry also. Eric and Larry go certified in water damage and mold remidiation, bought some equipment and were in the restoration business too! Shamrock has grown over the years to over a million dollar company per year. They have strived to make Shamrock’s clients happy and have a referral based company. There are many stories that can be told about interesting clients, special team members in many ways, and situations that could not be made up. This is Eric on his first day of Shamrock! Ready to clean air ducts. 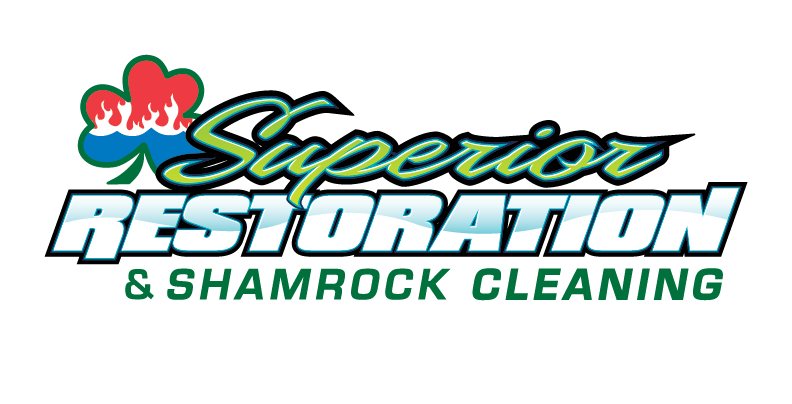 Shamrock Cleaning and Restoration is a subsidiary of Shamrock Inspection Services, LLC, of Liberty, Utah. Shamrock’s services including water damage restoration, carpet cleaning, mold remidiation, tile cleaning, sewage extraction and cleanup, air duct cleaning, upholstery cleaning, wood floor cleaning, and VCT cleaning, not small-lot weed abatement. Shamrock services both commercial and residential accounts. Shamrock Inspection Services and California Healthy Home are members of BSCAI, NACHI, and the California Hotel and Lodging Association. The company is also heavily involved in the Inland Empire business community as a Corporate Sponsor of the Rancho Cucamonga Chamber of Commerce, and as members of the West End Executive Association, and the Claremont and Upland Chambers of Commerce. Eric is pictured here on his first day of Shamrock. Eric Sprague is the founder and co-owner of Shamrock Inspection Services, LLC. Eric has a broad range of management experience. Prior to founding Shamrock Inspection, Eric was Vice President of Operations for Full Swing Golf, Inc. Full Swing Golf is the leading manufacturer of golf simulators in the world. While at the helm of Full Swing Golf, Eric personally oversaw large scale projects for clients such as Donald Trump, Michael Bloomberg, Michael Jordan, and a host of other celebrities. Eric also managed relationships with corporate clients such as Dicks Sporting Goods, Caesars Palace, The Golf Channel, Royal Caribbean and Princess Cruise Lines, to name but a few. In addition to his past professional experience, Eric is a NADCA-Certified air duct cleaning technician, an IICRC-certified carpet, stone, masonry, and tile technician, and an ITA-trained and NACHI-Certified home inspector. Eric brings a broad background of field experience to building care and maintenance, and takes great pride in helping others maintain a clean and healthy working environment. Eric is a graduate of Keene State College and the University of Utah. In his free time, Eric can befound high in the mountains of Utah skiing the world’s greatest powder snow. Co-owner Larry Wilberton is in charge of all marketing and back-office operations for Shamrock and Healthy Home. Larry is a graduate of Keene State College and Cal Poly Pomona as a computer programming and chemistry major. Larry’s operational abilities are the cornerstone upon which Healthy Home and Shamrock compete in the competitive cleaning markets. With a gift for creating systems, Larry has built a company which runs smoothly and soundly, creating value for its clients. Larry is also an IICRC-certified carpet technician. When not working, Larry is an avid triathlete and outdoorsman.